The 76mm cannon crashed back, the breech expelling the spent shell case onto the floor. The German machine gun nest was a smoking crater, bodies scattered around it. The tank commander, Lizvinskiy, peered through his periscope, scanning for the next target. Scurrying figures in field grey uniforms, scattered away in all directions. The fascist invaders knew the power of his KV-1 tank was unmatched. Lord of the battlefield, it feared none of the German tanks. The enemy infantry were simply cockroaches to be crushed under the wide rattling tracks. There was only one weapon to fear in the entire German army — the long-barrelled 88mm guns. They could kill a Kliment Voroshilov tank with a single shot, but they were huge guns, mounted on massive crucifix platforms. Hard to hide. Soviet infantry appeared behind him, finally advancing now that the enemy had been cleared out. Lizvinskiy looked around at the carnage and gave a satisfied nod. Here the Germans had learned that Russia was not theirs. Like all previous invaders, they would be defeated. With a massive roar, the KV advanced again. Soviet players in TANKS have been waiting for a while for something new to hit the battlefield but we have some awesome new options in these upcoming releases. 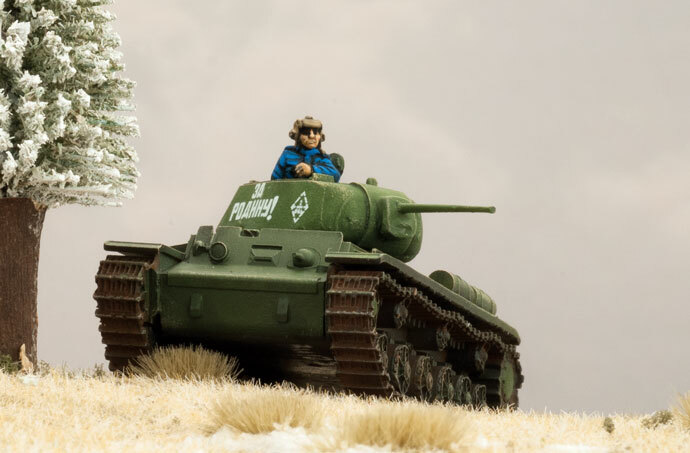 The T-34 maybe nothing new but with this new earlier version (also known as the T-34 obr 1942) we are getting a slightly discounted tank with less Initiative. If you add in the Factory Fresh card then you are getting a massive discount for the cost of having fairly low Initiative. 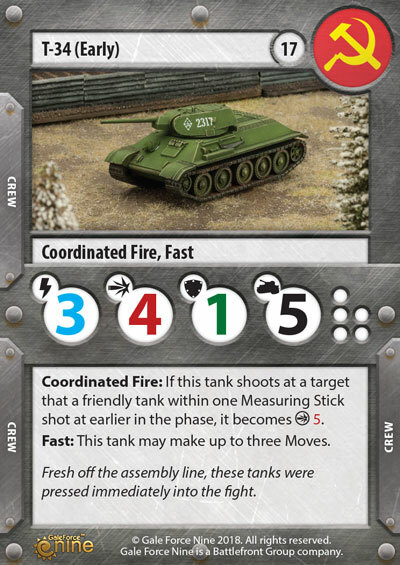 With this new card you can get six T-34 tanks into your platoon and still have 4 points left over. 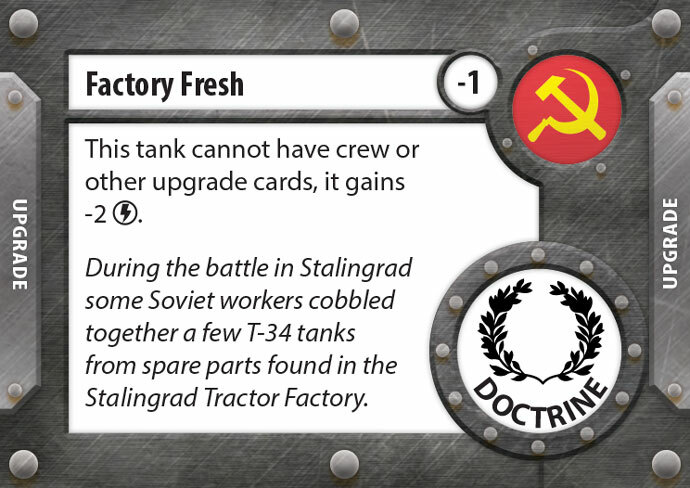 Factory Fresh gives Soviet players some great flexibility with points and Platoon design with the drawback of not being able to add any extra crew or upgrades. 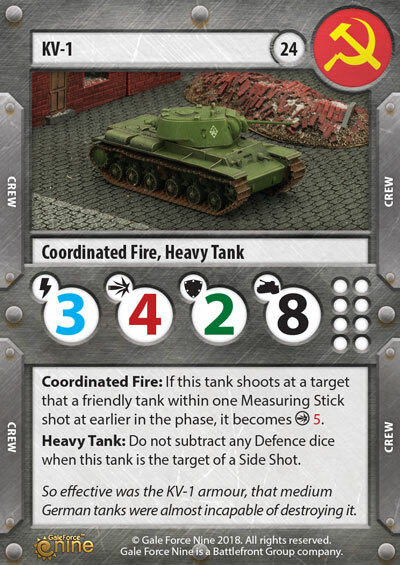 In the KV expansion we get two new additions to the range of heavy tank choices that Soviet players can pick from. The KV-1 is a power house of a tank, coming in at 24 points you can run four of these tanks and still have some points left over. The KV-1 tank’s heavy armour and its high defence will make it hard to kill on the battlefield. If the KV-1 is too slow for you, you may want to consider the KV-1s, this tank gains a good amount of Initiative making it incredibly well rounded. The tank itself is only 25 points, meaning that you could run four of these heavy tanks in one platoon, although running three and adding in some Heroes, Crew and Upgrades to enhance the whole Platoon may be a better option. One of the Heroes I would consider is Zinoviy Kolobanov. 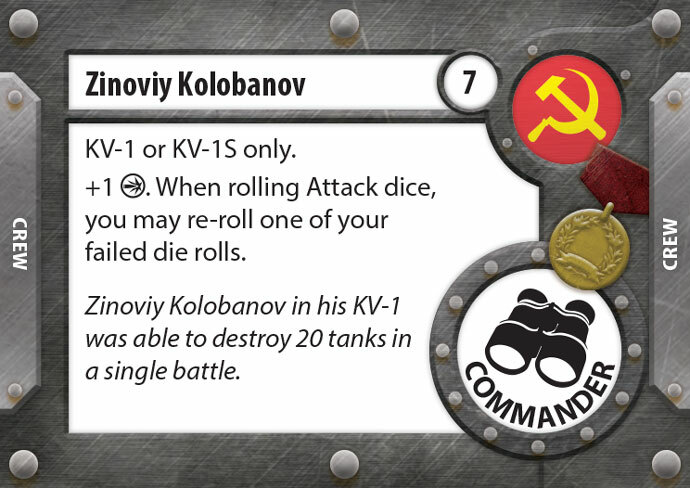 Kolobanov is known for his execution of a classic ambush on a German vanguard where his KV platoon were able to destroy 43 tanks before the battle ended. 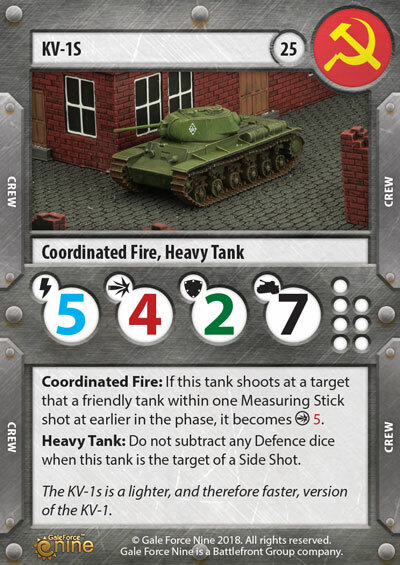 In TANKS he gives you an extra attack die and a re-roll when attacking, making him a very aggressive commander for seven points.